William Perley was born in 1813 in Bangor, Maine, and married Mary Jane Reynolds in 1843 in Van Buren County, Michigan. A good starting point for the descendants of William and Mary is Martin Van Buren Perley's History and genealogy of the Perley Family (1906, Salem, Massachusetts), where he lists the family in the supplement , and advises that "We are unable to place this family with any satisfaction...". The parents of William remain unknown, and hence his relationship to Allen Perley, if there is one. While many people have worked on finding William's descendants, the information contained here is my own compilation, and I have no doubt made some errors. You're encouraged to write if you find an error, or have additional information you'd like me to include. Maude married Cato Ellison , son of Abraham Ellison and Inga Monsen , about 1885 in North Dakota. 36 F iii. Lyda Mary Ellison was born on 21 Sep 1892 in Hoople, Walsh, North Dakota and died on 15 Sep 1978 in Corvallis, Benton, Oregon, at age 85. Lyda married Phillip La Veille . Lyda married Coyne Walter Graham , son of John James Graham and Lizzie Walter , on 25 Nov 1943 in Vancouver, , Washington. 38 M v. Ralph Ellison was born in Dec 1896 in North Dakota. 39 M i. Frederick August Wagner 10 died in Aug 1943. Frederick married Myrtle Oppen in 1927. Emma married Harold Dowling . Edith married Ed Roth . Doris married Ormand Moon . 1. Perley, Martin Van Buren, History and Genealogy of the Perley Family, (MVB Perley, Salem, Mass, 1906). 4. 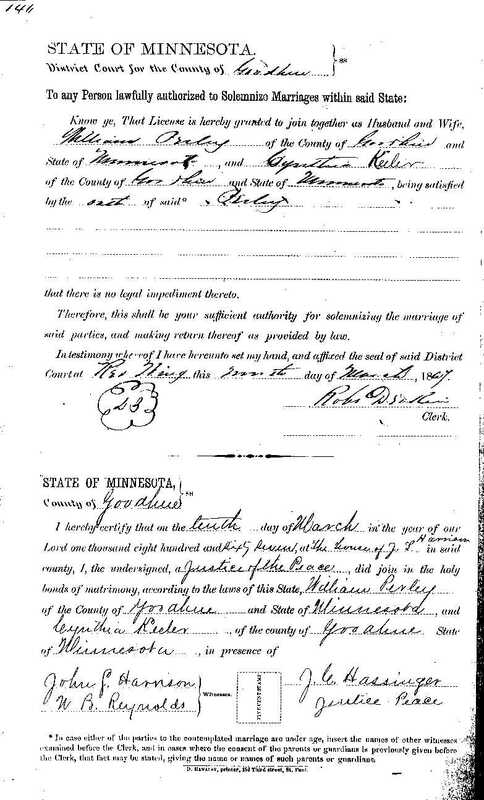 Marriage certificate for William Perley and Cynthia Keeler. 6. 1910 US Census, ED 158, dwelling 38. 7. 1900 US Census, ED 210 Sheet 6 Line 56. 8. McLean County Independant, July 1945, page 1. 9. Photograph of Maude Etta Perley, (1899). 10. Family History from Bob Dowling. 12. Washington State Death Index. 13. Obituary for Vernon Ellison, (Seattle Daily Times, Seattle, 8 Aug 1940). 14. Photograph of Hazel Abigail Ellison, (1913). 15. Corvallis Gazette-Times, (Corvallis Gazette-Times, Corvallis, Oregon). 16. Ibid, 20 Dec 1972, page 3. 17. Benton County Cemetery Records, (Mid-Valley Genealogical Society, 1990). 18. Phillips County, Montana, Marriages Book 1. 19. Email from Darryl Wagner, Note dated 2 May 1998.